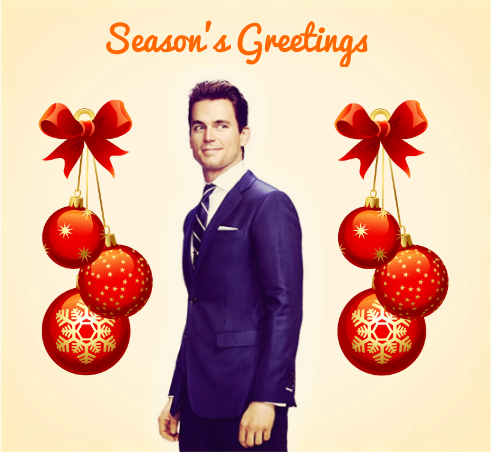 Ah, but the main reason I wanted to write this little post in the first place is to wish you all Happy Holidays \o/ Our little White Collar family has been my happy place for a long time, I was blessed with so many wonderful friends, I don't even know what I have done to deserve such luck ♥ So, whether you are celebrating now or have already finished celebrating, or you aren't celebrating at all - I still want to wish you all the best in those remaining days of 2013, and many happy moments for the upcoming year. Hopefully the Google hasn't borked this up, but Wesołych Świąt! And even if it has, may you have a merry, happy and joyful Christmas, my dear friend. Oh, lovely! Have fun over the holidays, catching up on all that reading (and screencapping *g*)!! I wish you all the best for the rest of the year and into the next too! Check my LJ tomorrow for three more Christmassy artworks plus this one! D'AWWWWWWWWW!!! "For Peter (unwrap gently)" - Perfect!!! Thank you so much for all the happiness that your wonderful art work provides. It always enhances the fics that it illustrates. And your minions were without doubt the funniest things of the year. Oh my god, I want to unwrap that present right now!!! :D But I'll gladly let Peter do the honors ;). Oh, yes, a fic for this woderful pic would be awesome. Merry Christmas to you too, Kanarek, and thanks for anything you are contributing to this fandom. I'm really happy to have found this fandom, and that you contacted me over a year ago. Happy Holidays!!! What a gorgeous picture! Merry Christmas to you, and enjoy your holidays !! I did try it on, but my brother has a bigger head than me. Merry Christmas to you! I hope you enjoy your days off. Much love for Peter's present up there! Merry Christmas to you too! I wish you all the best in 2014. Thank you for all of the beautiful artwork and the screencaps. And for your work on the whump lists too. Edit: Sorry, I did this from the mobile app earlier and it sent prematurely. Merry Christmas and Happy Holidays to you! !